The interim financial statements should be read in conjunction with the audited financial statements for the financial year ended 31 December 2017. The Group gross loans and financing for the 4th quarter 2018 ("4Q18") increased by 2.8% as compared to 4th quarter 2017 ("4Q17") mainly due to the proposed sale of personal financing, property financing and mortgage in 4th quarter 2017 amounted to RM1.513 billion. While the gross loans and financing for 4Q18 decreased by 1.9% as compared to 3Q18. The decrease was mainly due to decrease in corporate loans and financing portfolio. Personal financing - The gross income from personal financing in the current period was lower compared to the previous year corresponding period due to lower disbursements and decreasing portfolio base. Corporate loans and financing - The gross income from corporate loans and financing in the current period was higher compared to the previous year corresponding period due to the continued growth of corporate loans and financing assets base. Corporate disbursements amounted to RM2.0 billion in 4Q18 representing 29.46% of the total quarter disbursement of RM7.0 billion. Property financing and mortgage loans - The gross income from property financing was higher in the current period compared to the previous corresponding period due to growth in its financing assets base. This was partly set off by lower income from mortgage loans as its assets base decreases following conversion efforts from conventional mortgage to Islamic property financing. Auto financing - The gross income from auto financing was lower compared to the previous year corresponding period due to decreasing portfolio base. The Group profit before tax for 4Q18 decreased by 11.0% compared to 4Q17 respectively. The decrease was mainly due to lower charge of impairment allowances on loans and financing compared to 4Q17. The lower charge was mainly due to improvement of staging from Corporate portfolio for both Stage 1 and Stage 2 under MFRS 9 and higher 2017 impairment following the impairment programme. The higher operating expenses was due to integration costs. The Group profit before tax for 4Q18 decreased by 1.4% as compared to 3Q18. The decrease was mainly due to lower operating expenses. 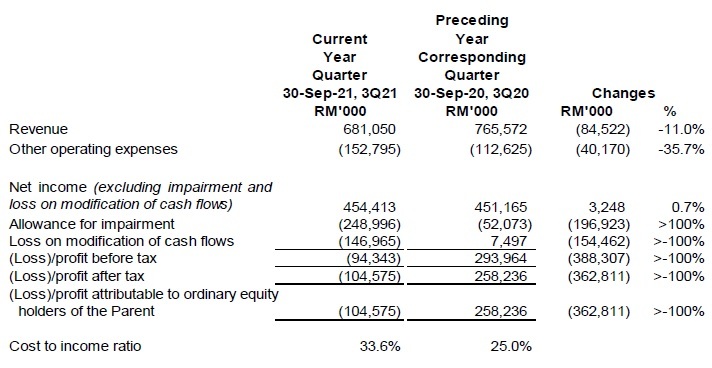 Impairment allowances for 4Q18 increased by RM28.4mil compared to 3Q18 due to improvement of staging for both Stage 1 and Stage 2 for Corporate portfolio. The Group cost to income ratio for 4Q18 of 25.2% increased from 4Q17. 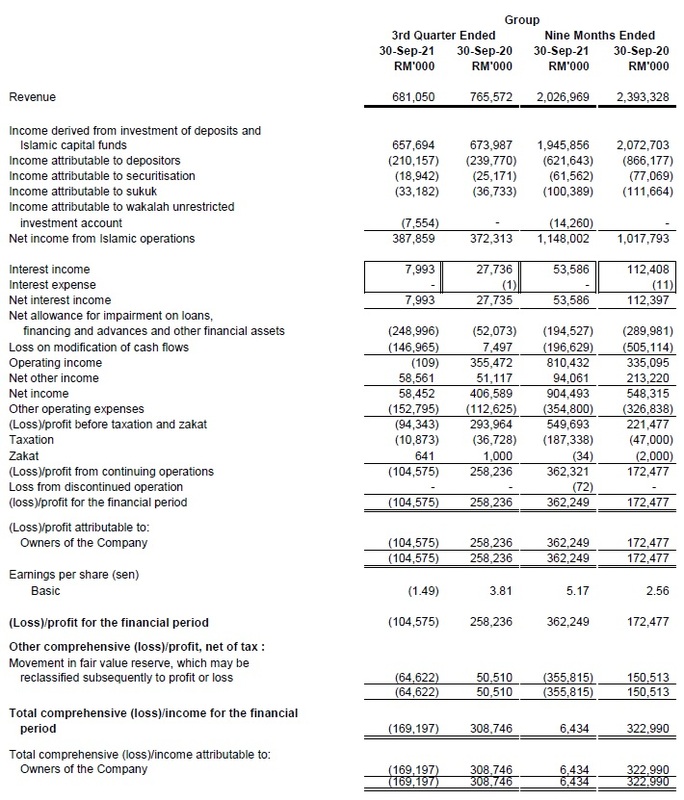 The increase was mainly due to higher costs relating to banking operations. 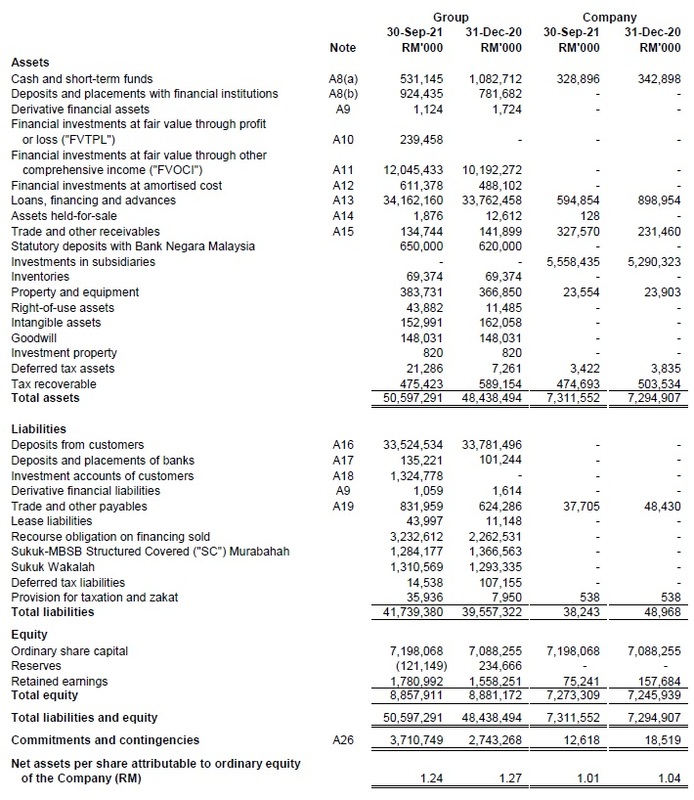 Subsequest to the vesting of Shariah compliant net assets as disclosed in Note A4, total assets of MBSB Bank of RM45.75 billion accounts for 100.7% of the total assets of the Group. While the Bank's equity represents 61.5% of the Group's total equity. Contribution of profit before tax of MBSB Bank increased in current quarter post the vesting of net assets on 2 April 2018 for the Company. Profit before tax and profit after tax in Q1 2018 prior to the vesting remains in Financial Holding Company. The Malaysian economy recorded a sustained growth of 4.4% in the third quarter of 2018 (2Q 2018: 4.5%), supported by expansion in domestic demand amid a decline in net exports growth. Private sector expenditure remained the key driver of growth, expanding at a faster pace of 8.5% (2Q 2018: 7.5%), while public sector expenditure turned around to register a positive growth of 1.1% (2Q 2018: - 1. 4%). On a quarter-on-quarter seasonally-adjusted basis, the economy grew by 1.6% (2Q 2018: 0.3%). Domestic demand expanded at a faster pace during the quarter (6.9%; 2Q 2018: 5.6%), driven by private sector activity. Private consumption growth accelerated to 9.0% (2Q 2018: 8.0%). Household spending was boosted in July and August 2018, following the zerorisation of the Goods and Services Tax (GST) rate1, particularly on durable goods such as motor vehicles and furnishings, as well as food and beverages. Continued expansion in income and employment provided key support to household spending. Private investment growth edged higher to 6.9% (2Q 2018: 6.1%), underpinned mainly by capital spending in the manufacturing and services sectors. During the quarter, frms further expanded equipment spending to cater to positive demand. Public consumption grew at a faster pace (5.2%; 2Q 2018: 3.1%). This was attributable to a higher spending on supplies and services, which more than offset the moderation in emoluments growth. Public investment registered a smaller decline during the quarter (-5.5%; 2Q 2018: -9.8%), due to improvements in General Government capital spending. However, capital spending by public corporations was lower as some projects were near completion. Gross fixed capital formation (GFCF) increased at a faster pace of 3.2% (2Q 2018: 2.2%), supported by type of assets, capital spending on machinery and equipment was higher at 5.9% (2Q 2018: 3.6%). Investment in other types of assets turned around to register a marginal positive growth of 0.1% (2Q 2018: -2.9%). Investment in structures grew at a moderate pace of 1.8% (2Q 2018: 2.1%), due mainly to continued weak investments in residential property. The Monetary Policy Committee (MPC) kept the Overnight Policy Rate (OPR) unchanged at 3.25% at the July, September and November 2018 meetings. At this level of the OPR, the stance of monetary policy remains accommodative and supportive of economic activity. The Malaysian economy is expected to remain on a steady growth path, with private consumption the main driver of growth, investment activity sustained and exports providing an additional lift to growth, albeit to a lesser extent. Underlying economic factors are providing continued support to domestic economic growth, including low unemployment and a surplus in the current account of the balance of payments. Headline inflation is expected to increase going forward, primarily due to higher projected global oil prices and the prospective floating of fuel prices. Underlying inflation, which excludes the impact of consumption tax policy changes, is expected to remain contained in the absence of strong demand pressures. Risks to the global growth outlook remain tilted to the downside, which could cause headwinds to the domestic economy. These include any further escalation in trade tensions; and spillover effects to emerging economies in an environment of greater volatility in the international fnancial markets and a faster pace of monetary policy normalisation in the advanced economies. Domestically, risks remain from prolonged weakness in the mining and agriculture sectors. In line with regional economies, the domestic fnancial markets continue to experience non-resident portfolio outflows due to global developments. Nevertheless, the fnancial markets remain orderly with domestic monetary and fnancial conditions supportive of economic growth. Exchange rate flexibility plays an important role as a shock absorber for the domestic economy. The fnancial sector is sound, with fnancial institutions operating with strong capital and liquidity buffers. Monetary operations will continue to ensure sufcient liquidity to support the orderly functioning of money and foreign exchange markets and intermediation activity. In the banking system, liquidity conditions remained sufficient at both the institutional and system-wide levels. Reflecting the overall non-resident portfolio outflows during the quarter, the level of surplus liquidity placed with the Bank was lower. Nevertheless, interbank lending and borrowing activities remained orderly. At the institutional level, most banks continued to maintain surplus liquidity positions. In line with most regional currencies, the ringgit depreciated against the US dollar in the third quarter of 2018 as external uncertainties continue to drive non-resident portfolio outflows amid a strengthening US dollar. The continued strength in the US dollar was supported by positive US economic data and outlook. Investor sentiments were also negatively affected by rising trade tensions and concerns over contagion risk from vulnerable emerging market economies. Going forward, the ringgit will continue to be influenced by external uncertainties as well as the trajectory of the US dollar. Domestic bond yields declined across tenures during the third quarter largely due to sustained demand by domestic institutional investors. This was mainly driven by expectations of supportive the Government. In September, however, the trend temporarily reversed, as heightened risk aversion in global fnancial markets led to further non-resident outflows from regional bond markets, including Malaysia. Total non-resident outflows from the domestic Government bond market during the quarter amounted to RM2.4 billion3. Overall, the 3-year, 5-year and 10-year MGS yields declined by 3.1, 8.6 and 12.9 basis points, respectively during the quarter. The Islamic banking industry in Malaysia has advanced significantly over the years. From a market share of 5.3% in 2000, Islamic financing now accounts for 34.9% of total loans and financing. Islamic banks also offer a wide range of competitive and innovative products, complementing solutions offered by conventional banks. While the growing depth and breadth of Islamic finance is an important barometer of progress, equally important is ensuring that Islamic finance delivers a positive and sustainable impact on the community, economy and environment. This vision is being realised through the adoption of value-based intermediation (VBI) by Islamic banks, which reinforces the intent of Shariah to promote good and prevent harm. VBI is being advanced to bring about a transformation in the business models and day-to-day conduct of Islamic banks. This was captured in a strategy paper that was developed in collaboration with the industry and issued by the Bank in July 2017. As the VBI initiative progresses to its implementation phase, the immediate focus in 2018 will be on developing tools for operationalisation and performance measurement. Guidance on applications and approaches to VBI will be developed to help Islamic banks navigate implementation challenges associated with different business models and maturity of individual Islamic bank’s operations. In addition, a scorecard will be introduced to measure both financial and non-financial progress of Islamic banks towards VBI adoption. This is expected to yield changes in the financing portfolios of Islamic banks, with at least half of new business and personal financing channelled to purposes that are consistent with VBI by 2020. Going forward, further targets will be set upon implementation of the scorecard. The Group’s business, policies and operations have been realigned following the acquisition of MBSB Bank (formerly known as Asian Finance Bank Berhad) on 7 February 2018. Investments are being made to upgrade and improve the delivery of products and services at various channels including internet and mobile banking. These investments include upgrade and enhancement of information technology infrastructure and services, people resources and upgrading of branches. The Group focus to expand the corporate business prior to the bank acquisition will continue, to reach the desire corporate retail portfolio mix. As a new Islamic banking group in the banking sector, the Group is looking forward to expand its products and services which include trade finance, wealth management and internet and mobile banking to cater various segments of our customers and depositors. Barring any unforeseen circumstances, the Group’s prospects for the year are expected to be satisfactory.